Snuffer’s Restaurant & Bar Fundraiser For Fallen Officers! You are here: Home / Dallas/Fort Worth Events / Snuffer’s Restaurant & Bar Fundraiser For Fallen Officers! Snuffer’s Restaurant & Bar will host a fundraiser for Rogelio Santader and Crystal Almeida. Rogelio Santander, a three-year veteran of the Dallas Police Department, was fatally shot on Tuesday, April 24 while assisting with an arrest at a Lake Highlands Home Depot. Along with Officer Santander, Officer Crystal Almeida was also shot and is still in critical condition but is showing improvements. 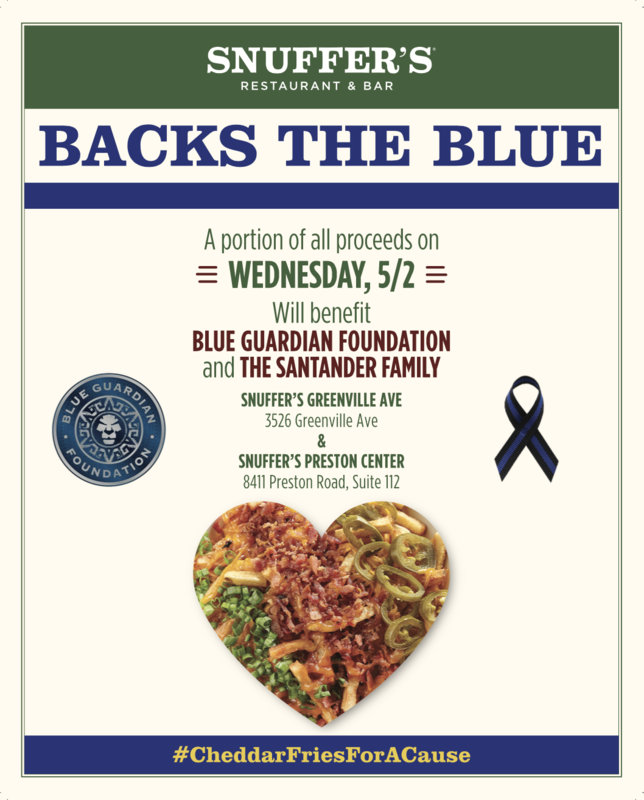 To honor these officers, both Dallas Snuffer’s Restaurant & Bar locations will donate a portion of the sales made on Wednesday, May 2 to the Blue Guardian Foundation to benefit the families of Officer Santander and Officer Almeida. The fundraiser will take place from open to close on Wednesday at these Dallas Snuffer’s locations – 8411 Preston Road and 3526 Greenville Ave. If you can’t make it out to the fundraiser, donate to the Blue Guardian Foundation directly at Paypal/BlueGuardianFund. For more information, visit Snuffers.com. The iconic Snuffer’s Restaurant & Bar brand has been a Dallas institution since 1978, serving its signature menu of legendary Burgers and famous Cheddar Fries. Snuffer’s is where friends and family gather to catch up, watch a game or enjoy a casual happy hour after work. CultureMap nominated Snuffer’s as one of the “Best Neighborhood Restaurants” for the 2018 CultureMap Tastemaker Awards. Open seven days a week, there are currently 13 Snuffer’s restaurants throughout North Texas, with the newest now open in Mesquite. For more information, visit Snuffers.com.